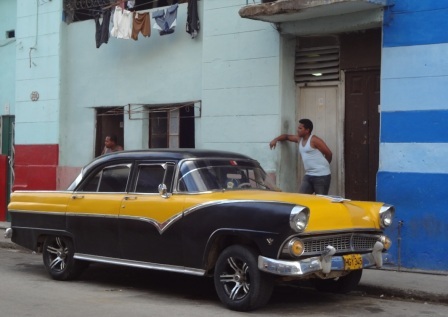 There is no sight more Havana than the rolling stock of 1950s cars that cruise the streets of the city. Cadillacs, Plymouths, Chryslers, Dodges and Fords are among the old American cars you’ll find in the extended parking lot in front of the Capitolio in Old Havana. 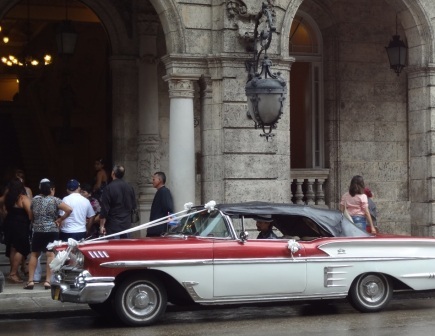 You’ll hear them honk their horns when carrying a newly-wed couple along the Malecon. 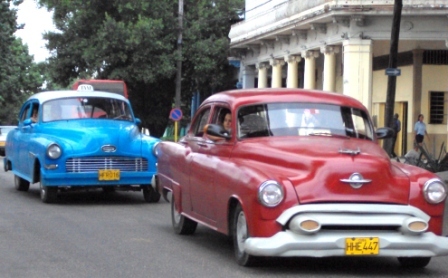 Or look anywhere in the streets of the city to catch a glimpse of these classic cars. When you walk along Neptuno, you’re on a main thoroughfare where taxis pick up fares for deposit all over the city. These are just some of the places where you’ll see these golden oldies of the auto trade still going. How do these cars still go, decades after America stopped shipping spare parts? They are running because when the Soviet Union was in Cuba during the Seventies and Eighties, entire American cars were shipped to Moscow where their parts were copied and reproduced, then shipped back to Cuba.